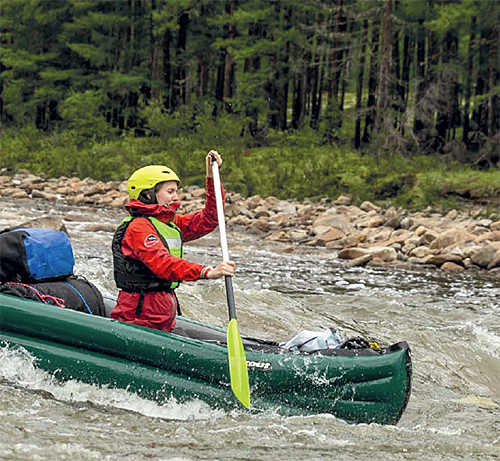 The Innova Scout inflatable canoe has a large inner space and a 992 LB carrying capacity make it ideal for adventures requiring lots of gear. This versatile canoe has a class III whitewater rating for fun on the river and is also great for families that want to spend some time together. An innovative system of T-BONE reinforcements strengthen the canoe’s floor providing for increase rigidity and improved handling that is comparable to a solid hull canoe. The Innova scout is made of high strength Nitrilon for superior durability and air retention. Features include a self-bailing bottom with a roll-up closure, thigh straps with a safety clasp, (3) solid wood seats with PE foam comfort pad, (2) pair of cargo straps, push-push valves, and a pressure relief valve in the bottom of the boat. Comfort is enhanced by seats with backrest and adjustable footrests. A repair kit, cleaning sponge, and kayak carry bag/back pack also come standard with the Innova scout inflatable canoe. In the Continental USA. This item normally leaves the warehouse in 1 to 2 business days. Double/Single action 6 liter manual hand pump.